Dear friends! We’re so glad 2018 is here and we hope you had a nice start of the new year, together with some good folks and a drink or two. We sure did at Royal in Mill last Saturday, where a lot of you showed up and welcomed 2018 with an old school night of 2 hours of our take on R’N’R. A week earlier we said goodbye to 2017 in a proper way, in a sold out Doornroosje with YOU. What a night. We tested a bunch of new songs, which we are about to record in the studio next month. The tour in Spain last October was also very helpfull to test those new songs and we are proud to have had the opportunity to let them hear on Doornroosje to our loyal wolfpack of fans and friends. Thank YOU for a memorable night – and a big thank you to the great supporting bands Grim Tim and The Cowpokes, the nice ladies of Naaistreek that embroidered our new patches on your clothing on the spot and of course all the good folks at Doornroosje!! Some of you sent us messages to ask what’s up with the delay of the fourth album and we highly appreciate your involvement with us. Sorry that we didn’t communicate about this earlier, but we were not sitting on our hands in the meantime. When you hit the studio with a rockband, anything can happen. We planned on recording our new album last April, but we felt we could get more out of our songs if we took more time to jam and see where it could take us. Now it’s almost 10 months later and we sure as hell are ready to record that album. So HELLO 2018! We’re anxious to share our brand new originals and you can expect to hear more from us on that matter soon enough. 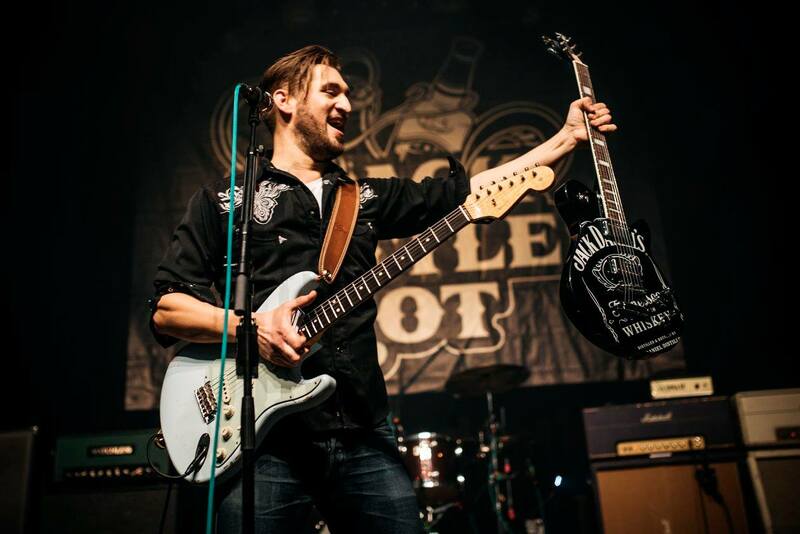 Simon giving away a nice Jack Daniel’s guitar at Doornroosje last week. Yeah, anything can happen at a BBR show! Pic by the lovely Marscha van Druuten.